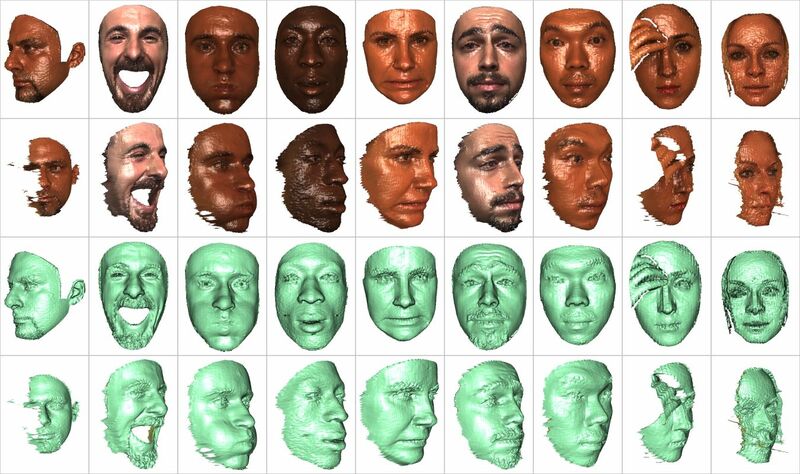 Facial data are acquired using structured-light based 3D system. Acquisitions are single view, and subjects were made to sit at a distance of about 1.5 meters away from the 3D digitizer. The sensor resolution in x, y & z (depth) dimensions are 0.3mm, 0.3mm and 0.4mm respectively, and colour texture images are high resolution (1600x1200 pixels). A 1000W halogen lamp was used in a dark room to obtain homogeneous lighting for good quality texture images. Snapshots from the Bosphorus Database. Samples are shown with and without texture, and both from frontal and 45° yaw views. Please go to the Content page for more snapshots.